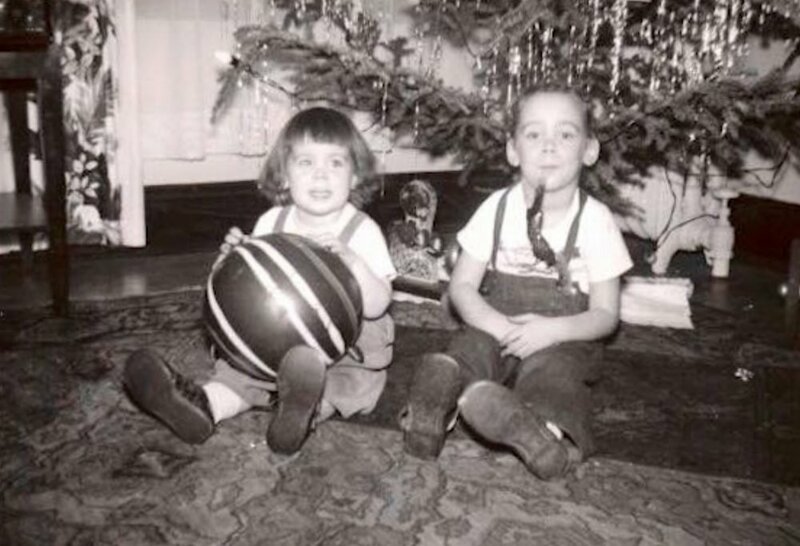 Barbara Ryan (left) and her older sister, Anita Solick Oswald, sit around the Christmas tree in their childhood home on West Madison Street in 1951. A patchy, unkempt lawn covers an empty lot on the corner of Madison Street and Keeler Avenue in West Garfield Park. Bare brick buildings and late-night corner stores surround the vacant site, where bits of broken bottles, styrofoam cups and crumpled papers have settled. A big, white “For Sale” sign propped up by worn, wooden posts is its only occupant. 69-year-old Anita Solick Oswald remembers that spot differently. Her childhood home—a three-story apartment complex—used to be right there. Oswald, her parents and her three siblings lived on the third floor while her aunt and uncle occupied the second; and, her grandfather’s Bavarian-style restaurant, Solick’s Restaurant, was on the main floor. Growing up in the ‘50s and ‘60s proved to be a different time, Oswald admitted. As the eldest, she was the leader of the pack, often rounding up the gang to catch a flick at the old Marbro Theater—also on Madison Street,—or play in Clark, Columbus and Garfield parks. They headed to the Off the Street Club, a boys and girls club, on Karlov Avenue and participated in programs. On days when the weather was nice, they rode the “L” or the bus into downtown to visit other hotspots like the Art Institute of Chicago. These memories are now tucked away in her debut book, West Side Girl, which features a small collection of short coming-of-age stories and is available on Amazon. For years, Oswald kept those stories to herself, only revisiting them when her daughters asked questions or in conversations with friends. Though Oswald and her family left the West Side by the early ’60s for Norwood Park (and Oswald ultimately traded in the Midwest for the Southwest), she found herself longing for the days spent hanging out in Garfield Park. Oswald, who worked most of her career as an IT consultant, aspired to be a writer and began taking classes at the University of Colorado Boulder. She crafted her stories in workshops and was able to publish some of them in literary magazines, but it was time she created a permanent place for them. She wanted all of her stories to be found in the West Side Girl. Oswald and her younger sister, Barbara Ryan, 67, recalled how their lives revolved around going to St. Mel-Holy Ghost School or being at home, and how all of their adventures just happened somewhere in between. Ryan felt like she always had someone to play with. “You knew everybody,” she said. At an early age, Oswald, Ryan and their childhood friend, Mary Pat Cross, 66, understood West Garfield Park to be a predominantly white and working-class community. During the late ‘50s, West Garfield Park became more integrated as more black and migrant families started moving into the area. Across the country, the Great Migration contributed to the city’s change in demographics, Oswald said. In Chicago, construction of the Eisenhower Expressway, formerly the Congress Expressway, played a role in Garfield Park’s diversity since it forced out many residents from the southern end of the community. In the West Side Girl, Oswald’s story “Upside Down Year,” touches on how more black students were attending her school. At the time, the students were looking forward to a sock hop, and there were concerns on whether the white and black students would get along. “Kids our age just wanted to get out there to dance and have fun,” Oswald said. Though the women in Oswald’s family had already set those examples and expectations, she remembered meeting one particular single mother who remained resilient in the face of challenge. This woman moved into the apartment with her husband and five children, Oswald said. Shortly after, her husband abandoned them, leaving her with the financial and parental responsibilities. In that moment, she knew that having a support system was the key to helping someone grow into success. Oswald and Ryan recalled when their mother welcomed a homeless woman into their home and cared for her for some time. Their mother later paired her with churches and different resources in the community. That act of charity and kindness influenced Oswald and Ryan’s own well-being. “I hope people will see that by giving a small helping hand, it can be life-changing,” Oswald said. Several decades have passed since Oswald and Ryan lived on the West Side. They have only found their way back to the city through business trips or visiting some relatives still in the area. Ryan, who currently resides in New York, said her accent is a lasting souvenir from the West Side. There’s something in the way she pronounces her a’s that even when she and her husband lived on the South Side, people could tell that she, too, is a West Side girl. As for Oswald, reflecting on her childhood in Garfield Park especially as an adult, has helped her better understand who she is and made her grateful for where she is from.